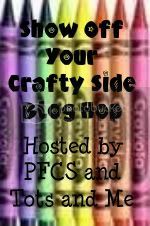 Show Off Your Crafty Side blog hop is hosted by Purple Froggie Clay Stuff and Tots and Me. And here's just a little "blip" (as the co-hostess worded it) about herself.. 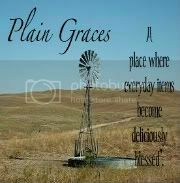 Plain Graces is the place where the graces of everyday items become special and deliciously blessed. Topics range from recipes, saving money, crafts, education, Nebraska tales, and the occasional Monkee post. Stop by for some midwest hospitality. We want you to link up as many crafts, shops, recipes, sewing projects and DIY projects as you want.. This blog hop will be open all week long, starting on Tuesday night at 8 PM Central Standard Time, so be sure to check back often as more crafts get linked up with us. This is a great way to show off and find some fun things to do. **Each week we will choose someone from the link up to be our guest host. If you would like to be considered for the guest host position, just post something about this blog hop, include the blog hop button from above, follow both hostesses on GFC, comment letting us know you are interested in being a guest host. Thank you for sharing with us! If you have linked up a craft with us, now you can grab the button below and add it to your blog if you would like.. I forced my sons to watch the DVD, The Monkees - Our Favorite Episodes , the other night. They were less than impressed when I told them they needed to watch at least one show. They were slightly amused, but they got a kick out of the retro commercials for Rice Krispies and Kool-Aid. It's good to know my children are easily enthralled with quality commercials. I keep telling myself that they won't jump on any bandwagons. I am hoping positive thoughts will overcame the flash and allure of fabricated advertising campaigns. I was preoccupied with my boys being influenced by advertising, that I didn't notice the effect it had on me. I was inspired by this little number: It shows the "boys" munching on cereal beside the Monkee Mobile. Davy pulls a fast one and has developed a truly unique way to eat his cereal- sugar and all! I decided to try my hand using Davy's method at breakfast this morning. We didn't have Rice Krispies, but cornflakes were on the menu. The children gave me a weary eyed look as I poured in the sugar, then the milk, and in the other bowl I put the cereal. Obviously, I didn't pay too much attention the first time I saw this commercial. I am old enough to know better. I shouldn't have copied what I saw on television, especially if it aired in the late 60's performed by a group of musicians named The Monkees. My kids knew better, but I still went ahead with my feat. Okay, a little mess. I can handle that. I had to review the clip on YouTube, and notice that Davy doesn't put the cereal in the other bowl. This is only a sign of the fun to come. I finally did get my cereal. Although, Davy would not approve of my bad form and sloppy technique. Have you tried this? Do you have a fun way to eat your cereal? Pumpkin doesn't have to be designated only for Halloween or Thanksgiving. This recipe is a favorite for my family. It's amazing the way warm pumpkin and melting chocolate tangle together and mold into the perfect dessert. We've had a bit of bad weather and a lot of rainy days. It's hard to believe that Memorial Day weekend is right around the corner. We were sidetracked playing Candy Land when I accidentally overcooked a loaf of bread a few mornings ago and we decided to re purpose this dry hunk of wheat and yeast into a special treat. I have numerous requests for this standby and it tastes great cold the next day for breakfast. Yes, breakfast. It can't be any worse than a doughnut- right? In a separate bowl, mix the eggs, sugars, pumpkin, spices and vanilla. Add the milk. Stir until everything is mixed. Add your bread cubes and coat. Let the mixture sit for a few minutes to absorb the pumpkin sauce. In a greased 9x13 pan or small ramekins, spread out your pumpkin bread pudding. Top with sprinkled chocolate chips and brown sugar. I place my bread pudding container in a large sheet cake pan. I then fill the outer pan with a layer of water about 1/4 inch thick. This prevents burning and steams the pudding. Place it in a preheated 350 degree oven and bake for about 45 minutes. You will need to keep an eye on this. The time may vary, check for doneness by looking at the rise and feeling the middle of the pudding. You want it a little brown and puffy. Remove from the oven and let sit for awhile. This is great served warm with whipped cream or cooled. I love dolls and frilly things, but boys are my lot in life. I LOVE my sons, but every now and then I want to indulge in something feminine. One of my favorite activities growing up was when Grandma and I used to trace my mother's old paper dolls. We would design new dresses and outfits, sitting at her kitchen table for hours snipping and coloring; planning party dresses and the perfect baseball uniforms for our dolls. I still have the old paper dolls we used. I am guessing they are from the late 50's or early 60's. These dolls are more kid-like than their traditional Barbie counterparts. Their attire is gorgeous and makes me wish I could dress for a tea party. I am including the templates I drew several years ago for my neighbor's little girls and church group. I don't have all the dresses and outfits drawn out, but you could easily create your own by using the basic structures. I prefer colored pencils and thin markers to detail the dolls and their wardrobes, but crayons work well for little hands. I have adapted the dolls for different activities in the past. Here are a few ways I adapted this basic template. I traced their images onto non-fusible interfacing paper (I think this is the right term), colored them, and used them on the felt boards. I have pasted the images to magnets and let the children play with their dolls on the fridge. Remember paper dolls don't have to be plain! markers, crayons, colored pencils, and embellishments like glitter, flowers, ribbons, etc. Print or draw your dolls. As you can tell, I am not a perfect artist. My dolls have character! Color your dolls and outfits. Glue the dolls onto the cereal box. Rub the glue evenly and press out all air bubbles. Finish coloring the outfits and cut out all the clothes. Make sure you leave the tabs. Cut out your dolls when the glue has dried. We decorated an empty oatmeal container to resemble a house. This is where our dolls will reside and be stored in. Summer is here and the sun has decided it needed a vacation. Gloomy is an understatement. Clouds and rain drops are starting to dampen our summer break. We have been stuck indoors and the children are getting antsy. What to do? Naturally, we build forts. This isn't our best work, but I am saving pictures to post later. Blankets, pillows, chairs, and clothespins are the boys' favortie materials. They typically use the dining room table for the base and branch out using my great grandmother's dining chairs. They eventually take over the dining room and creep into the living room. I have to be the big bad mommy and insist on a path to walk through the rooms. I am challenging you to a fort contest! The fort must incorporate blankets or sheets. Only items you have in the house can be used- no running to the store! No nails or screws can be used. You may use Velcro, zippers, clothespins, etc. A picture of your fort and a small explanation must be e-mailed to me no later than June 30th. Each member in the family can submit a claim, but an adult will need to e-mail me and include their name on the submission. Follow on Facebook for updates and fort building tips. I have a few experts residing under my roof that are more than willing to share their ideas. 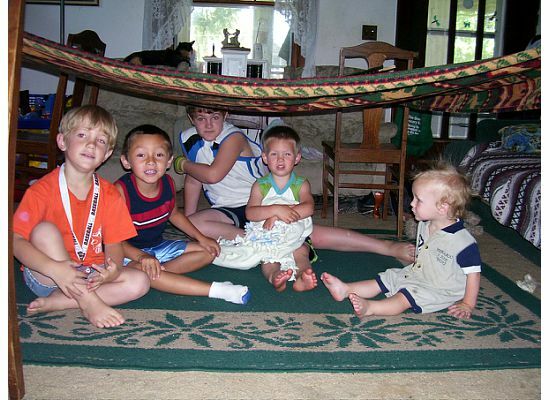 Get busy and create the best fort ever! Here is a simple recipe for braised pork that is a great alternative to humdrum taco meat. I love this recipe for several reasons. It's easy, cheap, and tasty. I can get several meals from one roast and it actually tastes better the next day. Braising pork fills the house with wonderful smells and doesn't require you to turn on the oven. We enjoy eating the meat on toasted corn tortillas or on good flour tortillas. 3 or more hot peppers- we have used jalapeno, habanero, serrano, etc. Second, you need to sear the meat in your pan. Add a little olive oil and brown your pork chunks. Season them with pepper, onions, salt, and garlic. When they are browned on all sides, add enough water to cover the meat. Throw in a few carrots and celery ribs, cover, and bring to a boil. Simmer for several hours until the meat is tender and the liquid has reduced. Remove the carrots and celery from your meat. Reserve and drain the liquid from the meat. I let the broth sit a few minutes and spoon out the grease that has separated. You will need this broth to make the sauce. Shred the pork with a fork or a potato masher. It should be very easy to pull the meat apart. In the same pan, brown the braised meat. You want it to be a little crispy before we add the sauce. I mix a can of tomato sauce, 2 cups liquid, 2 tablespoons crushed garlic, and 3 or 4 chopped hot peppers from the garden. I use whatever I have. This time I used frozen habanero peppers I had in the deep freeze. You can add more or less- it depends on how much heat you enjoy. I throw in a small amount of brown sugar to take some of the edge off . Simmer for an hour or more, until the sauce is reduced. I let the meat sit for about 15 minutes before serving. My family enjoys this with warm corn tortillas or crisped tortillas. We also use flour tortillas. Tonight, I used what was in the house. We topped them with traditional taco toppings. Lettuce, cheese, salsa, olives, sour cream, and more. A friend must be scanning her pictures, because she had a massive amount of old photos from the 80's and 90's. Here is a fun one she posted. 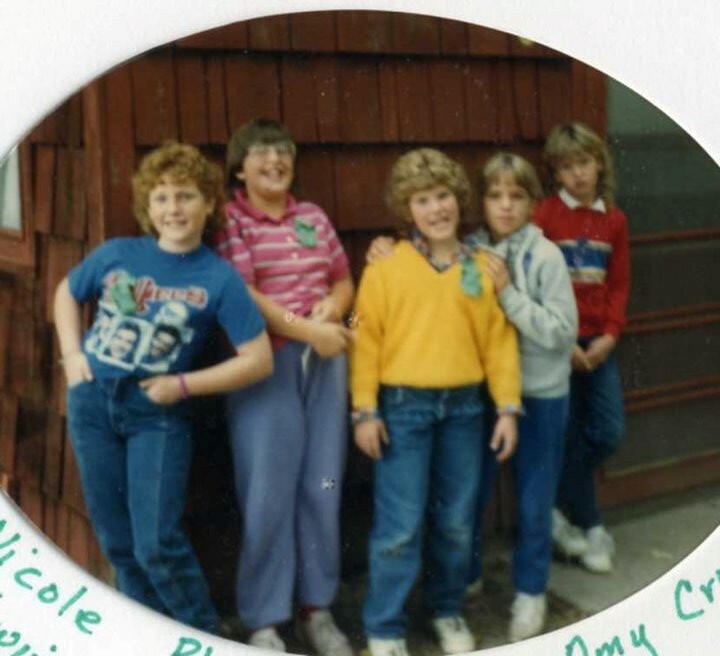 I am the crazy redhead sporting a perm and the Monkee shirt. I decided to go with a guest post today. He doesn't know I am posting this and he probably would slam his door and stomp his feet if he knew. I found his writing when I was going through his school papers. He wrote this little missive in between assignments when he was bored. It scares me a bit, because I can totally see him acting out his story. I think I am seeing a connection between the toaster and a ceiling fan incident years ago. So, with out further delay- Here's my second grade son's story about the toaster. One summer day Bob and Mom were in their house eating toast. Bob thought about what else you could put in a toaster beside bread. You can put waffles, poptarts, and bagles. He looked at the plastic bread from his play kitchen and thought what about plastic bread? He took a piece and put it in the toaster. The toaster began to smoke and then it broke and made a loud BAM! Mom rushed in the room. Mom yelled at Bob! "Bob, only food goes in the toaster." Mom sighed and said, "Let's go buy a new toaster." "Come Bob," said Mom, "Get in the van." Bob got his coat and got in the van. I didn't edit this. It's truly his story and I doubt the teacher read this. It brings back memories of a ceiling fan...This post is from the very beginning of my blog! The school bus just dropped off my boys for their summer break. I am a bit moody about the whole affair. I love having the boys home and spending time with them, but I love the structure school gives us. Those three are rambunctious, noisy boys who enjoy bickering. What am I to do? 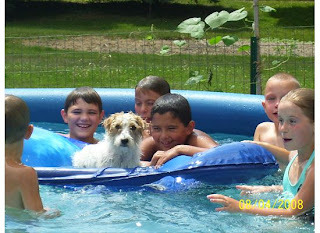 Teddy Kent, the dog, even enjoys summer! I am a grump, battling my inner child against the strict mother inside me. I am the grinch of summer. I try and try to prevent it from coming, but no amount of planning or signing up the boys for camps can stop Mother Nature. I have set bedtimes, routines, and a break during afternoon naps. Our days are predictable and focused. Now, I can kiss those times goodbye. My pity party is hopefully over for now. I made a list of a few things to look forward to this summer. I might find the joy of the last day of school hidden somewhere in the recesses of "motherhood". 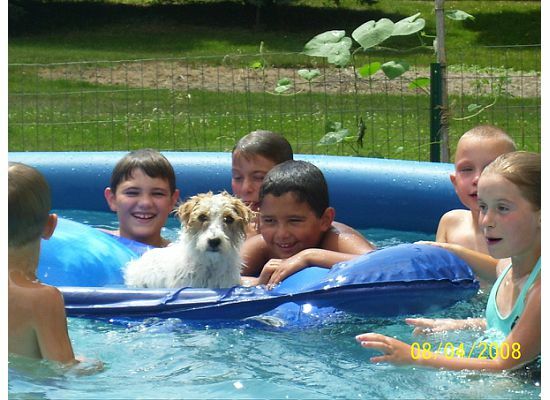 I need to remember the joy and anticipation of a lazy summer. I picture skipping home from school, ginger braids jumping in rhythm, and my dress blowing in the wind. I think I finally tapped into the excitement of the last day of school. I am ready to wear flip flops and catch lightening bugs. I am going to romp in the grass and tease my boys during a game of "monkey in the middle". I will have sons to mow the yard, weed the garden, and run to get the mail everyday. I am going to read classic literature introducing them to Huck Finn, Captain Nemo, and the Count of Monte Cristo. I just might torture them with a "girl" book to even out the mix. I want well rounded boys- right? We are going to feast on warm picked raspberries straight from the bush. We are going to fish for trout and camp out in the yard. I will tell them scary stories by the fire pit and eat burned marshmallows. We will go tubing down the creek and look for fossils in the rocks. I hope to sneak in a few picnics and tour some landmarks off the beaten path.